This fall, Sustainable Jersey officially recognized Garwood as bronze-certified. Sustainable Jersey is a nonprofit organization that provides tools and training to support communities as they pursue sustainability programs. 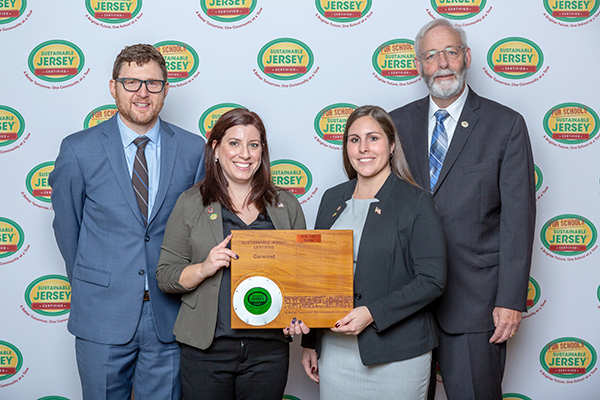 By earning 150 points in the Sustainable Jersey certification program, Garwood successfully demonstrated that it provides a sustainable environment for its current and future residents, and is now eligible to benefit from the organization’s many grants that support waste-reducing measures and improve environmental equity. A few of the actions that Garwood accomplished on their way to certification include: creating a Green Team, promoting socially responsible pet ownership through a Companion Animal Pledge, installing a permanent drug drop-off box at Borough Hall, as well collaborating with the borough’s Emergency Management Officer and Police and Fire Departments to further enhance Garwood’s emergency management planning. Another significant component of the certification was the institution of a Mayor’s Wellness Program. Through this program, and working in conjunction with a nutritionist at a local Shoprite, Garwood was able to provide nutrition and wellness programs for children, seniors, and its employees. 3K walks and recreation activities round out this program. Garwood is one of 210 municipalities in the state currently certified, with over 400 municipalities participating. Garwood proudly distinguishes itself among the ranks of other bronze municipalities in New Jersey and aspires to continue bettering its community through sustainable efforts. (above, l-r) Randall Solomon, Executive Director, Sustainable Jersey; Garwood Council President Jen Blumenstock; Garwood Councilwoman and Mayor-Elect Sara Todisco; and Richard Dovey, Chairperson, Sustainable Jersey Board of Trustees. Blumenstock and Todisco received Garwood’s Plaque at the Sustainable Jersey Annual Luncheon at the League of Municipalities in November.